Where to Buy Blazon Blue Spray Pattern Indicator, Blazon Blue Spray Indicator - no more blue finger - 2.5 gallons - $134.95 for Sale with Fast Free Shipping! Its use is intended for mixture with herbicides and other pesticides so that the treated area is temporarily identified. Rate : 2.5 Gallons of Blazon can make 1,333 gallons. 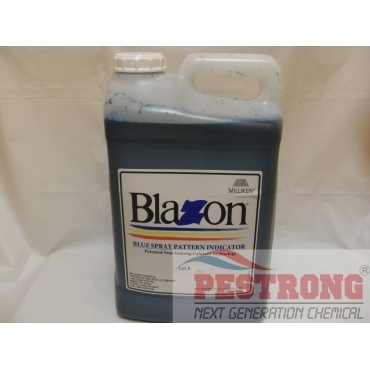 *Blazon is not intended for use on edible crops. mixes well with pendulum, yellow plus blue color makes a perfect green for you lawn! We use this for applying spray. It works well and no clog up the sprayer. Shows exactly what was sprayed. A little goes a long ways.